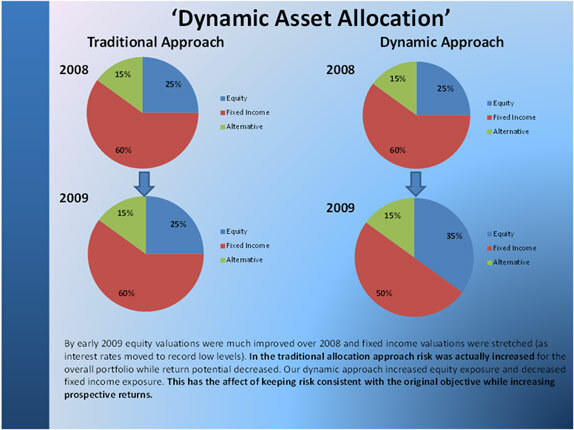 The core of our investment philosophy at Traphagen is a low cost ‘dynamic asset allocation’ strategy. In conjunction with this core approach we also employ tactical ‘satellite’ investments and place added emphasis on tax and cost minimization. Unlike most investment firms we hold your level of risk constant and adjust asset allocations through time as market conditions dictate. Traphagen monitors all asset class long term projected returns, risk, and correlations. These inputs are then used in conjunction with our mean variance optimization (MVO) model and are vetted through our investment committee to produce an ‘optimal’ asset allocation given a set level of risk. It is our main objective as a portfolio manager to maximize your total ‘after tax/after fee’ investment return given a level of acceptable risk. When conditions warrant Traphagen will employ our SmartHedge™ risk management strategy to your portfolio in order to protect against downside volatility. This is a combination of portfolio hedges, volatility captures, managed ‘trend’ strategies, and defensive option strategies which allow market upside participation while guarding against significant downside risk. Must be cost efficient. Traphagen feels the cost of the hedge must be 1% or lower in most cases to be feasible. The hedge must not ‘give back’ all gains produced once the market recovers. If the hedge exhibited this behavior the investor would be better off holding cash instead of the hedge or not hedging at all. The hedge should not be highly correlated with the markets nor should they be perfectly negatively correlated. Again if the hedge did exhibit these tendencies the investor would be better off not hedging or simply holding a percentage in cash. Hedge should not be ‘market timing’ dependent. Correctly and consistently ‘timing’ market tops and bottoms is impossible over the long term, therefore any hedge dependent on this will fail. The hedge should allow for some market upside participation regardless of market conditions. Dynamic volatility-equity investment which allocates between traditional S&P 500 and volatility exposures depending on market conditions, loatility levels, and market performance. Volatility/Mean reversion hedge that extracts positive returns from higher volatility periods in the markets while not surrendering those returns during calm periods. This combination of efficient hedges within a diversified portfolio produces significant downside protection without materially limiting upside return potential over the longer term. Longer term future earnings/cash flows can be estimated with an above average level of confidence (highly cyclical, leveraged, or small companies are rarely bought). Preferred companies have very steady, well defended, and predictable earnings/cash flows. Current stock price is below our estimate of fair value (providing a margin of error) and also represents a superior risk-adjusted return versus owning a diversified market index ETF. Traphagen estimates a securities fair value by utilizing our custom ‘conservative discounted cash flow’ model. We take a conservative estimate of ‘sustainable cash flow’ (which smoothes out booms and busts in corporate earnings) and then project conservative sustainable growth into the future. We apply a 10% discount rate for most securities (which is the return that we demand for owning the stock) and this generates our fair value estimate. 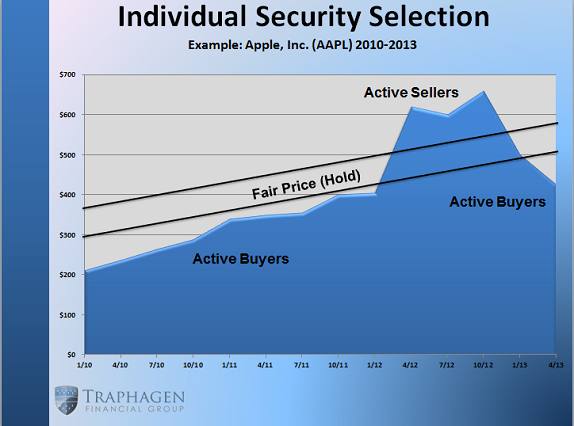 We then set sell and buy targets for each security and invest appropriately. The below graph depicts what our cash flow model would have predicted as fair value for Apple stock through time beginning in 2010. Our estimated fair value for Apple is represented by the ‘hold zone’ on the graph which increases through time as the absolute value of free cash flows available to shareholders increase. At any time if the actual stock price rises above this ‘hold zone’ we would be active sellers of the stock and any time it falls below we would be active buyers. We employ this same strategy for all individual securities we purchase. One of the largest determinates of investment returns within US equities is the investors allocation among industry sectors. Traphagen actively looks to overweight sectors that we feel will outperform the general market and underweight sectors that will underperform on a continuous basis. This provides superior risk adjusted returns versus simply holding the S&P 500 index. Using a proprietary metric weighting model Traphagen determines a ‘sector score’ for each sector. If the score is above (below) certain levels we will overweight (underweight) the sectors(s) within our US Large Cap Equity Allocation. Every year in depth research is completed which encompasses general capital market assumptions and asset class specific return, risk, and correlation estimates. Using this research as our foundation the investment committee establishes estimates for shorter term (1 year) and longer term (10 year) returns for each asset class. More weight is given to the 10 year return estimates as historically these have been more reliable than shorter term return forecasts. Once we have our estimates for asset class returns, risk, and correlations we run a ‘mean variance optimization’ (MVO) model which optimizes our allocation to every asset class given a set level of risk (measured by standard deviation). This risk level is governed by your investment objective (risk ranges from a SD of 4.5% for Stable Value Fixed Income to a SD of 18% for Aggressive Growth). Most traditional managers employ a static asset allocation and periodically rebalance. This actually decreases or increases risk and return potential as asset class valuations and correlations change over time. As prudent managers it is our job to maximize return with a constant level of risk, and this is what ‘dynamic asset allocation’ accomplishes. Traphagen believes keeping investment fees to an absolute minimum is essential to delivering long term superior investment returns. This is one aspect of investment management that we have complete control over and therefore we look to take full advantage (where possible) of the lowest cost products available. Through our partnership with Fidelity and Schwab we are able to buy/sell many very low cost ETFs (Exchange Traded Funds) for no commission charge. These ETFs enable us to invest in a wide range of asset classes for very lost cost (as low as 0.07% per year vs. traditional mutual funds that could have fees as high as 1.5% or more per year). For every $200,000 invested approximate fee savings of $1,000 per year is realized when comparing our portfolios with a 100% traditional mutual fund portfolio (assuming 0.425% average fee for our portfolio vs. 0.925% with an all mutual fund portfolio). It should be noted this savings is realized year in and year out regardless of market returns. There are certain asset classes and investment strategies where no ETFs are available and therefore some traditional mutual funds remain an important part of our client portfolios. We constantly monitor client portfolios for the opportunity to ‘harvest’ tax losses or gains for federal and state income tax purposes. This is the process by which we will actively sell one position to recognize a loss or gain (depending on what exactly we are trying to accomplish) and then immediately replace the original position with an near identical position. This captures the loss or gain (which defers or eliminates income taxes) while not affecting your overall investment exposure. Again this is something we have control over, so Traphagen invests a lot of time and effort monitoring portfolios for possible harvesting opportunities. Traphagen pays special attention to Asset Location between accounts to maximize tax efficiency. We ‘overweight’ tax efficient assets in taxable accounts, while using tax deferred accounts to house tax inefficient assets. This results in greater ‘after-tax’ returns as a result of deferring or avoiding taxable income/gains. As the above graphic depicts we use IRAs to house high yielding assets. This includes most bonds and real estate. We can use these accounts to shield these cash flows from immediate taxation. 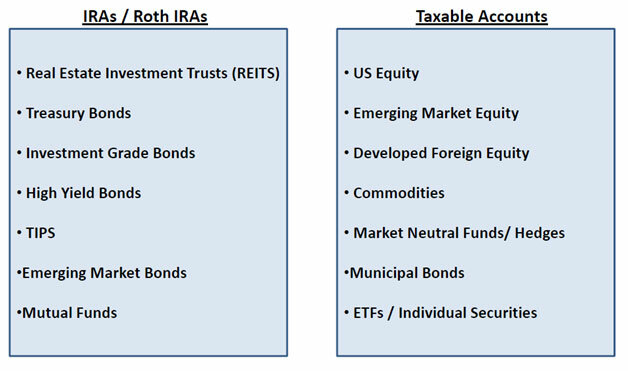 In some cases we can permanently eliminate taxation on the income generated from these assets if allocated to a Roth IRA. Most equities, commodities, and all municipal bonds are held in taxable accounts. Most equities and commodities produce relatively low cash flow (and if they do it is normally qualified income) while municipal bonds produce no federal taxable income. If executed correctly this ‘asset location’ strategy can add between 0.2% and 0.4% per year to after tax returns regardless of market returns.